So you want to buy a speaker but you haven’t a clue where to begin? What’s the best system set up for your living space, what is a soundbar, and what does a 5.1 speaker system refer to? We’ve broken down all of the unnecessary jargon and created a glossary of the most commonly used speaker terms to ensure that your speaker purchasing experience is a painless one. Absorption: In audio terms, acoustic absorption signals a structure, object, or material, absorbing sound energy when sound waves collide with it, as opposed to reflecting the energy. Acoustic Power Level The acoustic power level is the total sound energy emitted by a source per unite time. The unit of measurement is the acoustic watt, also known as sound power. Amplitude Modulation (AM) Amplitude modulation is a method of encoding a signal onto a radio carrier wave by varying its amplitude. If a speaker is being played beyond its natural volume levels, this can lead to bottoming. Bottoming occurs when the voice coil smacks into the back of the pole plate or the spider hits the top plate, resulting in a very unpleasant sound. Capacitor A capacitor is a passive electronic component that consists of two metallic plates, separated by dialectic. It is used to store electric charge. The Class A amplifier is the most commonly used power amplifier configuration. In a Class A amplifier, the output device is always “on” so that it provides output current during the complete signal cycle (over a 360 degree interval). Class B amplifiers only amplify half of the input wave cycle, and as a result, create a large amount of distortion. However, their efficiency is hugely increased and is much better than Class A. Class B amplifiers are also favoured in battery-operate devices like transistor radios. Class B has a maximum theoretical efficiency of almost 80%. This is because the amplifying element is completely switched off half of the time and so it cannot expend power. Clipping is a type of waveform distortion that occurs when an amplifier is overdriven and attempts to deliver a current or output voltage beyond its maximum capability. Crossover A crossover is an electronics device that takes a single input signal and creates two or three output signals consisting of separate bands of mid, high, or low range frequencies. These bands of frequencies feed the different speakers in a sound system. Comb Filtering occurs when two identical audio signals are summated together with a small delay between them. The cause of the delay is usually due to a physical separation of operating speakers or drivers that are driven in the same frequency band. A crossover is an electronics device that takes one single input signal and creates two or three different output signals consisting of separated bands of mid, high, and low frequencies. These different bands of frequencies feed the various drivers in a sound system like tweeters, woofers, and subwoofers. An electrical current can be described as the flow of electric charge. The decibel (dB) is the unit used to measure the intensity of sound. Diffraction refers to the bending of sound waves around objects, and the re-radiation of energy through an opening. Diffraction is the reason that we can hear sound around corners and behind walls. In acoustics terms, diffusion is the power at which sound is spread evenly throughout a given environment. Dynamic range is the difference in decibels between the overload level and the lowest acceptable signal level in a system or transducer. Efficiency, not to be confused with sensitivity, is the percentage of electrical power converted by the loudspeaker into acoustical power. Frequency is classified as a periodic vibration whose frequency is audible to the average human. It is measured in Hertz(Hz) and is recognised as the property of sound that most determines pitch. Frequency Modulation is the process whereby the frequency of a carrier wave changes in according to the intensity of the signal. While this is occurring, the amplitude and phase of the carrier wave remain constant. Frequency response is the quantitative measure of the output spectrum of a system or device in response to a stimulus, and is used to characterise the dynamics of the system. It is a measure of the magnitude and phase of the output as a function of frequency, in comparison to the output. A harmonic is a signal or a wave whose frequency is an integral multiple (1,2,3,4, etc.) of the fundamental frequency. The standard unit used to measure frequency that equates to one cycle per second. IMG, which stands for “Injected Molded Graphite”, is a type of material used for speaker cones. Impedence is the measure of the opposition that a circuit presents to a current when a voltage is applied. An inductor is a component in an electric or electronic current which possessed inductance i.e. a coil of wire. Loudness level is defined as the sound pressure level of a 1000Hz tone that is perceived to be as loud as the sound being measured. Modulation is the process of varying an electric signal by superimposing the signal’s characteristics onto a carrier wave so that it carries the information contained in the signal. Octave is the interval between one musical pitch and another with half or double of its frequency. Ohm’s Law concerns the relationship between the voltage and current in an ideal conductor. This relationship states that the potential difference (voltage) across an ideal conductor is proportional to the current running through it. The constant of proportionality is referred to as the “resistance”, R.
Power is the rate at which electrical energy is transferred from an audio amplifier to a loud speaker. It is measured in watts. Power response is the variation of sound power as a function of frequency. This describes hard surfaces which do not permit sound to penetrate the surface. In this instance, nearly all energy is reflected back towards the source. Resistance is the opposition to current flow. It reduces the number of electrons flowing through the conductor. In other words, the higher the resistance, the less current flow in the conductor. The Ohm is the unit used to measure resistance. Reverberation is the collection of reflected sounds from an enclosed space, such as an auditorium. Sensitivity measures the amount of sound output derived from a speaker with one watt of power input from an amplifier. Sound can be described as vibrations that travel through the air or another medium which become audible once they reach the human ear. Sound Intensity is the sound power per unit area. A soundbar is a special loudspeaker enclosure that creates a reasonable stereo effect from a single cabinet. They are much wider than they are tall, partly for acoustic reasons, but also so that they can be mounted above or below a display device eg: under a television or above a computer monitor. A subwoofer is a complete loudspeaker which is dedicated to the reproduction of low pitched audio frequencies known as “bass”. The typical frequency range for a subwoofer is 20-200 Hz for consumer products, below 100 Hz for professional live sound, and below 80 Hz in THX-approved systems. Subwoofers are intended to heighten the low frequency range of loudspeakers covering higher frequency bands. Sound pressure level is expressed in decibels (dB) and is a measure of sound pressure relative to the hearing threshold. THX is a high fidelity audio/visual reproduction standard for home theatres, movie theatres, gaming consoles, computer speakers, screening rooms, and car audio systems. It was implemented by Lucasfilm Ltd. to ensure that the sound you hear is almost identical to how it was produced in the studio. Tweeter refers to the driver that produces high-frequency sounds in a speaker system. A 2.1 speaker system combines two speakers and one subwoofer. This simple setup is ideal for enjoying music and movies while providing better sound quality than most built in television speakers, but with less wiring and fewer speakers than a 5.1 speaker system. A 2.1 speaker system is ideal for smaller spaces such as single rooms or apartments. A 5.1 Speaker System is made up of left and right speakers, two rear surround channel speakers and one centre channel speaker to make a total of five main speakers and one subwoofer. 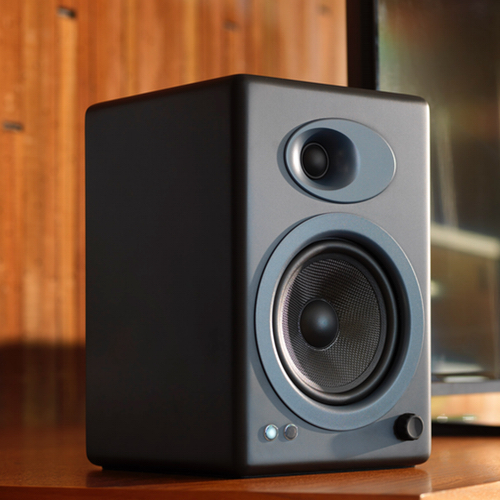 A 5.1 speaker system is a slightly more complicated setup than a 2.1 speaker system, but the sound quality is superior as a result of the addition of the rear surround speakers. A 5.1 speaker setup is best suited to average-sized rooms and is ideal for those looking to create a home theatre system on a budget. A 7.1 speaker system adds to additional back surround channels to a 5.1 setup. A 7.1 surround sound systems delivers more realistic and in depth sound thanks to the two extra back surround speakers. The overall result is a fuller and more immersive sound experience, suitable for larger home-theatre rooms. Notice any that we’ve missed? Let us know in the comments!